Below is the Camping Costa Brava complete list of all campites in Tossa de Mar. BUT before you look through the list...please click here to open in a separate window...How The Camping Costa Brava Accommodation Directory Works? Want to see if Tossa de Mar’s beach is the beach for you? Take a look at the pictures of Tossa de Mar and sneak a peek at the beach webcam. Location: This Costa Brava camping site is situated on the beach (the small cove of Cala Llevado)!! Cala Llevado is a very pretty sandy beach about 60 m long hidden amongst pine trees. The only access road to the beach is through the campsite, so non-camping visitors have to park about 15 minutes walk away...this puts off quite a few people, so often the beach is only used by the campsite guests. There are 3 other coves in the same bay, which are also lovely. 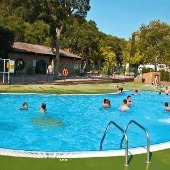 Camping Cala Llevado is 3 km south of the town centre of Tossa de Mar. 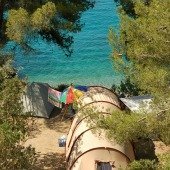 Description: Tent camping on the beach!..The tent camping section of this Costa Brava campsite is pretty special - the pitches are on the cliff over looking the beaches and are shaded by pine trees. There are pitches for caravans (maximum length 5m), but not many. This is due to the uneven ground in the campsite. There are electric pitches, non-electric pitches and bungalows with own bathrooms. Camping Llavado also has a restaurant, bar, supermarket, laundry, fridge hire, children’s playground, swimming pool, children’s swimming pool, children’s entertainment, adult entertainment, water sports, guided walks and bike tours, table tennis, big chess, game and book library, doctor, ATM, and wifi. Pets are allowed (but not in hired accommodation). Open from April to mid-September. Word of warning if you have children...you will need to keep an eye on them, due to the campsite being on a cliff. Location: This Costa Brava camping site is situated on the beach (the small cove of Cala Pola)!! Cala Pola is a very lovely sandy beach amongst the pine trees. 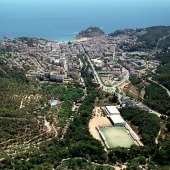 Camping Pola is 4 km north of the town centre of Tossa de Mar. Description: Camping Pola has 80 pre-assembled tents as well as shady dirt floor electric and non-electric tent and caravan pitches. Camping Pola also has a restaurant, bar, snack-bar on the beach, supermarket, laundry, fridge hire, children’s playground, swimming pool, children’s paddling pool, children’s entertainment, adult entertainment, TV room, games room, tennis courts, skate-park, scuba diving, doctor, shuttle bus to Tossa and wifi. Pets are allowed in one area of the campground (and not in hired accommodation). Open from last week of May to second week of September. Location: This Costa Brava camping site is situated 300m from the town centre of Tossa de Mar and 800m to the nearest beach. Description: Camping Can Marti has shady grass/dirt floored electric and non-electric tent and caravan pitches. Camping Can Marti also has a couple of restaurants, bar, snack-bar, supermarket, laundry, fridge hire, children’s playground, swimming pool, children’s swimming pool, games room, football, volleyball, badminton, baseball, doctor, car wash and wifi. Pets are allowed (but they will not be admitted without their vaccination papers). Open from second week of June to last week of August. Location: This Costa Brava camping site is situated 1km from the town centre of Tossa de Mar. 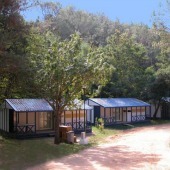 Description: The only accommodation available at Turismar are wooden bungalows with own bathrooms. Camping Turismar also has a restaurant, bar, snack-bar, supermarket, disco, laundry, children’s playground, swimming pool, games room, mini-football, volleyball, badminton, table tennis, petanque and wifi. Location: This Costa Brava camping site is situated ...m from the town centre of Tossa de Mar and 3km to the nearest beach. Description: Camping Tossa has shady dirt floored electric and non-electric tent and caravan pitches. It also has bungalows and mobile homes with own bathrooms. Girona 10 if offering 1000+ places in 23 different types of accommodation in Girona on 25th January for only 10€ per person. And, in case that is not enough, many monuments, museums and concerts are free or are discounted during the weekend of the 23-25th January. Sorry - the draw for this offer has ended, but check back with us regularly for more great offers.